Cosy cottage retaining original features. The cottage is situated in a rural peaceful area with panoramic views of the surrounding countryside. Surrounding the cottage is rough uncultivated land of rocks, whin bushes, bog land and marsh therefore more suited to adults as there is no play area. Two bedroom cottage sleeps 3/4 people. Cosy sitting room with large open fireplace. The kitchen provides everything you need for home cooking with dining table. White bed linen, white towels (fresh towels supplied mid-week)central heating and fuel for open fire supplied without charge. Electricity is metered (2 euro coins). Baby cot and high chair available. The cottage is certified by Failte Ireland "Irish Tourist Board"
We have two cottages on the site, each with their own private laneway and patio: see advert 623913 to view the other cottage. Gemütliches Häuschen in traumhafter Natur! Wir haben unseren Urlaub in Fanad sehr genossen. Das Haus ist sauber, hübsch und mit allem ausgestattet was man benötigt. Gelegen in der wildromantischen Natur im Norden Irlands, sah man rundherum nichts außer sattgrüner Weiden, Hügel und ein paar Schafe und Kühe. Es war der perfekte Ausgangspunkt für Ausflüge. Irland hat dort soviel zu bieten. Traumhafte Strände, wilde Klippen und unberührte Natur. Unsere Gastgeberin Margaret war so aufmerksam, liebenswürdig und hilfsbereit. Wir wurden mit frischem Gemüse und leckeren Scones begrüßt und selbst für unsere Tochter wurden auf die Schnelle noch ein paar Spiele und Bücher organisiert. Wir können unsere nächste Reise an diesen Ort kaum erwarten und werden dann sehr gern wieder Gast bei Margaret und Michael sein! Ein uriges Cottage, in dem es an nichts fehlt. Die Lage ist beeindruckend und lässt einen gut zur Ruhe kommen. Sehr liebenswerte Gastgeber empfingen uns freundlich und standen auch die ganze Zeit über für Informationen zur Verfügung. Interessante Ziele im Norden Donegals und in Nordirland sind problemlos in Tagestouren erreichbar. Absolutes Muss: Besichtigung von Michaels über 400 Jahre altem Familiencottage, zu dem er uns gerne einlud. Danke! The area and the cottage were fantastic. The cottage was very authentic and the area very picturesque. We really enjoyed relaxing in front of the open fire. Micheal and Margaret were great hosts and provided us with fire and towel supplies throughout the week. The local beaches are beautiful and quiet, pefect for a scenic walk. We definitely recommend for a relaxing break in the countryside and will be back next year! Das ist einfach Irische Lebensart in Perfektion. Das Cottage liegt absolut ruhig die Vermiter kümmern sich um alles, man bekommt wertvoll tips und vor allem haben wir in den 10 tagen selbst angebautes gemüse und Obst erhalten. was will man mehr. jederzeit wieder ein Aufenthalt hioer in Fanad. Très jolie maison dans un cadre idyllique. La route toute proche est très tranquille et ne nuit en rien à la tranquillité du site. Le nouveau pont tout proche permet de rejoindre rapidement la péninsule voisine. Accueil très chaleureux par les propriétaires toujours disponibles et dont les confitures et les légumes sont délicieux. Mer avec plages de sable fin et côtes rocheuses toute proche, promenades et nombreux sites à visiter. Le Donegal est une superbe région qui n'a rien à envier au Connemara, mais avec beaucoup moins de touristes. Une région à ne pas manquer. Nous y avons passé de très agréables vacances. 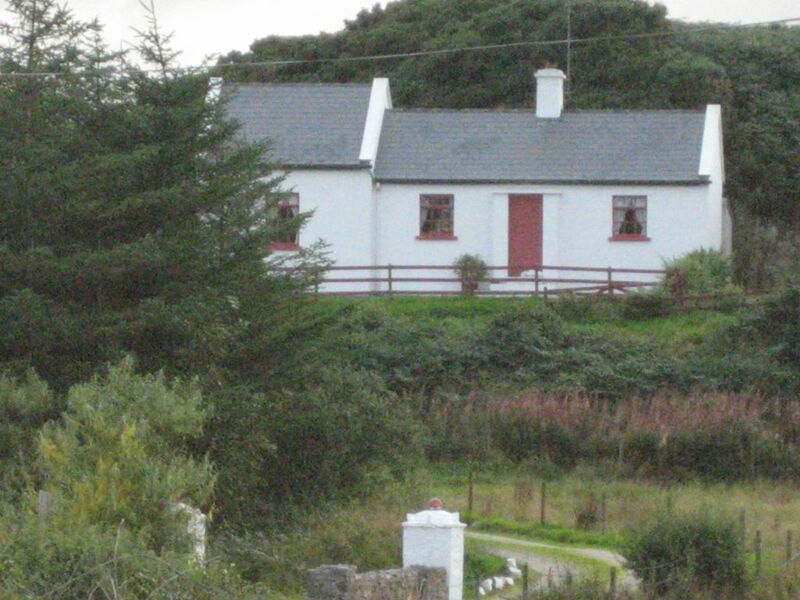 The cottage is close to the Atlantic coast on the route of the Wild Atlantic Way in the scenic Fanad Peninsula. Follow route Ramelton - Milford - Kerrykeel - Fanad. Margaret will be at the cottage with the turf fire burning and have everything nice for your arrival. The cottage is a 5 minute drive to the Atlantic coast, blue flag Ballymastoker beach and 18 hole golf course. There are many quiet roads and country lanes to enjoy walking and cycling. Possibility for fresh water fishing, angling, surfing and horseriding. The Fanad Peninsula in Donegal North West Ireland is scenic with mountains, hills, lakes, deserted seashores, sandy sheltered beaches and rugged Atlantic coastline. It is a sparsely populated farming and small fishing community. There are several small hamlets consisting of grocery store, church, restaurant and pub. It is one of Ireland's few remaining Gaeltacht areas in Ireland where the Irish language and culture is preserved. Margaret and Michael will assist in any way to make your stay a pleasant and enjoyable experience.